Address: 157 Rock Pointe Cres. 157 Rock Pointe Cres. Rock Pointe Estates RM of Edenwold. MLS#SK763386. Beautiful curb appeal on this 2,225 sq. ft. walkout bungalow with triple in-floor heated insulated attached garage (approx. 38 X 32) with walkout level over 4400 sq. ft. of living area. Home backs South. Garage also includes a 3pc bathroom. 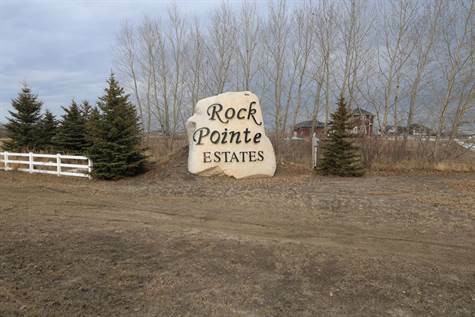 This property is located on 3.5 acres and is close to Pilot Butte (11 kms from Regina). There are 3 bedrooms on the main level, 4 bathrooms and a large laundry room. The walkout level is framed for a recroom, kitchen/bar area, 3 bedrooms, 2 baths, large utility room/laundry & storage rooms. The main floor has an impressive foyer with 10 foot ceiling, grand entrance door with sidelights, ceramic tile flooring and overlooking staircase to walkout level. The main floor & walkout levels both feature 9’ ceilings. The kitchen and livingroom feature a 2 sided gas fireplace. The kitchen has an abundance of maple cabinets with granite counter tops, large island with built-in microwave, 2 built in convection ovens, gas range/5 burner, stainless hood fan, Professional series Frigidaire refrigerator/freezer combination and a spacious eating area. There is also a large walk in pantry. The Livingroom has a tray ceiling, grey laminate flooring, large window facing South, gas fireplace, pot lighting & is wired for speakers/surround sound. Upon entering the huge master bedroom there are gorgeous double glass doors, large walk-in closet/motion light and a 5pc bathroom with a huge tiled shower/upgraded fixtures, deep soaker tub, double sinks in granite countertop/maple vanity & heated tile floor. There are 2 spacious additional bedrooms with large windows. There is also a 2pc bathroom off the kitchen as well as the laundry room. Extras: All soft close cabinets in house, main level interior/exterior/garage wired for speakers, C/air, large 60 gallon Indirect Water Heater, C/v & sweep, Air Exchanger, 2 gas bbq hook-ups, 3 garage remotes/openers. This is a great family home with so much to offer. A must see!